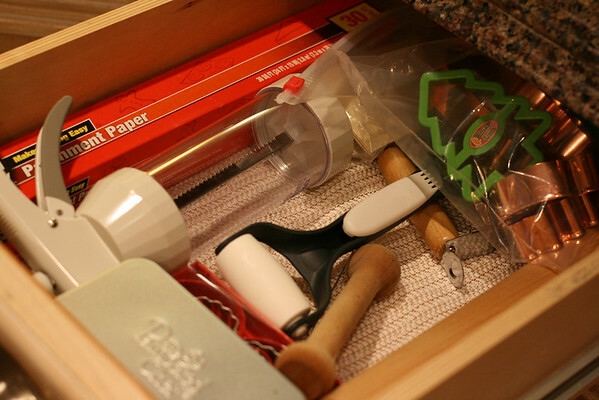 I embarked on the hefty project the other day of purging and reorganizing our kitchen. 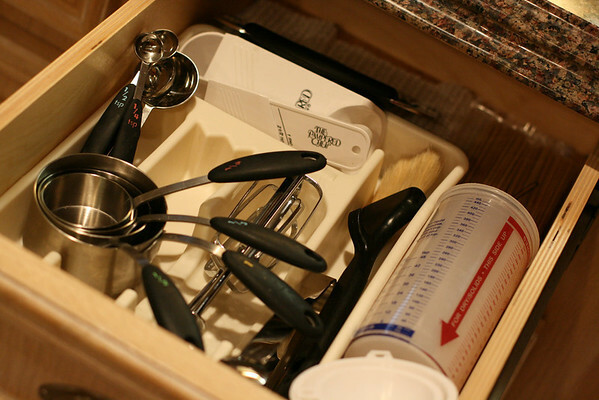 Having lived in our home for almost nine years, our kitchen cabinets and drawers had accumulated quite a lot of, ahem, stuff. 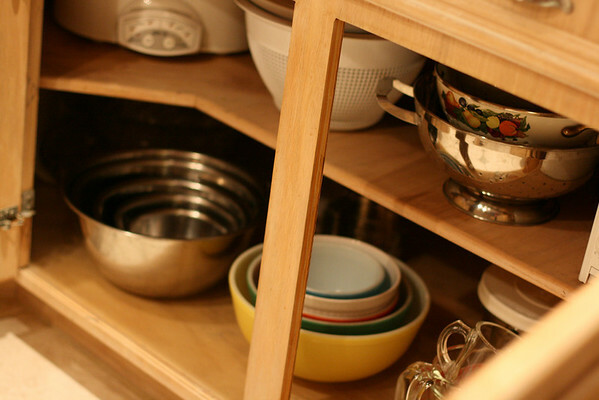 Years ago when we moved in, I put a lot of thought of how we would use the kitchen and tried to organize the cabinets based on that. For example, pots and pans near the stove, glasses near the fridge, everyday plates near the dishwasher, etc. 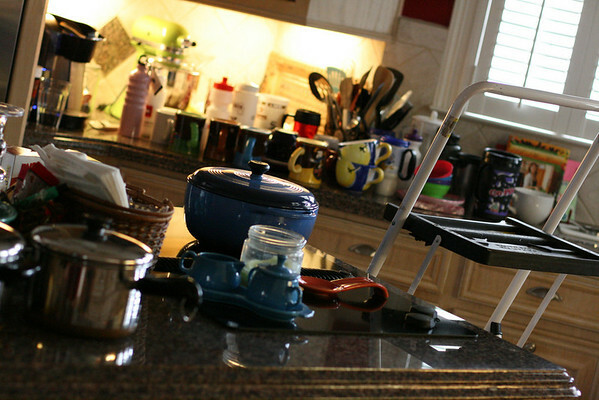 Over the years not only has our family changed (we now have a little person that is capable of helping with kitchen tasks), we got more, and more, ahem, stuff. What spurred this recent overhaul? Well, I bought a new dutch oven (because apparently I must have everything Pioneer Woman uses in her kitchen) and it was left to sit on the stove top because there was no cabinet space. 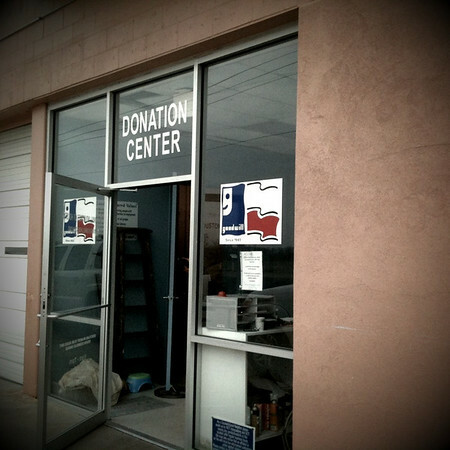 My first tasks were finding empty boxes, buying big trash bags and taking every cotton pickin' thing out of the cabinets. Could someone please tell me why we had 600 plastic sport bottles, cups and old coffee mugs? Do you think I could jam one more spoon or spatula in the wire basket on the counter? Nope. Getting to the things you use most frequently should be easy, not a challenge--and certainly not life-threatening (or sanity straining). Things that were too used or just plain junk went in the trash bags. Everything in fair condition went into boxes for Goodwill. I kept telling myself that if I wasn't using it, then it was outta here. 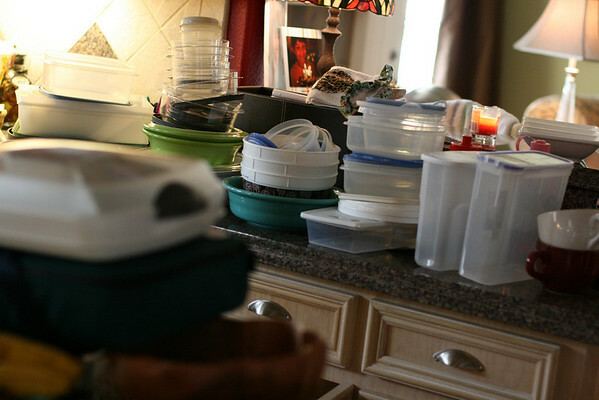 Why on earth was I hanging on to duplicate pots, pans, casserole dishes, plastic ware, serving bowls, and utensils I never used? Do you think I have enough plastic ware, huh, do ya? Mercy me! Oh, and yes, those are boom-zoom mugs from the Friends heyday, circa what, 1995? and another one for measuring stuff. 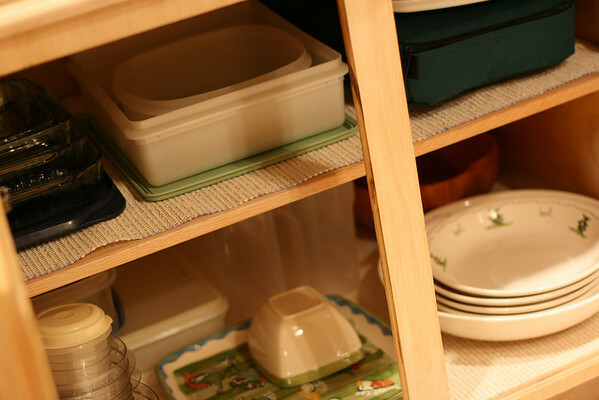 Look how calmly the casserole dishes, plastic ware, an a few miscellaneous dishes are resting on their shelves. They have space, they can breathe, they won't fall on my foot every time I open the doors. Mixing bowls, larger measuring cups, cutting boards, our toaster and crock pot are much happier now that other junk is no longer cramping their style. Serving bowls, a forgotten blender and a bundt cake pan are in the back since I don't use them very often. Now that the duplicate pots and pans that I wasn't using are history, Baby Blue has a drawer all to herself. I also filled the other drawers on the island (where our stove top is) with the pots I do use. Doing that freed up a shelf for a new purpose, which is one of my favorite changes... This roll-out shelf is right beside our dishwasher. I shamelessly copied The Nester's brilliant idea of moving her everyday dishes so they are more accessible to the littles. 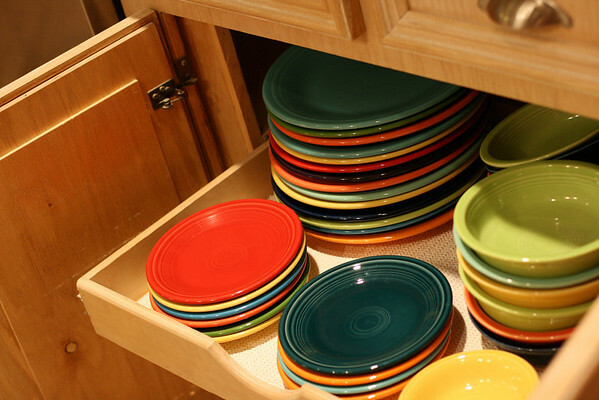 Our Fiestaware used to be crammed in a high cabinet that was too small for the sheer volume of Fiesta that we have. Annelise, Little Miss Independent, would climb up on the counter to get what she needed and I would always cringe because 1. )she was on the counter and b.) it was just asking for a dropped dish. Or child. I told her I moved the dishes so she could reach them better and so she could help unload the dishwasher. She was thrilled! She's six, what can I say? I think I need to tweak the shelf a little because right now it's a bit too heavy for her to pull out by herself. Certainly don't want to impede child labor or anything. A place for foil, plastic wrap and baggies!! 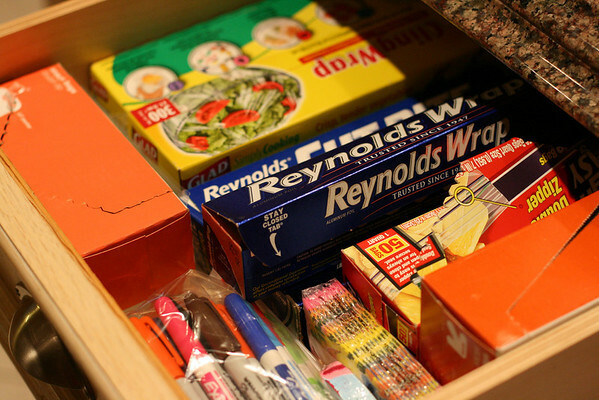 I have moaned for years about wanting a drawer for this stuff instead of it being stacked in our pantry, but I never did anything about it. I know. Doing this also freed up a much needed shelf in our pantry. Hooray! I can't believe how happy those two drawers make me now. Do you think I need to get out more? 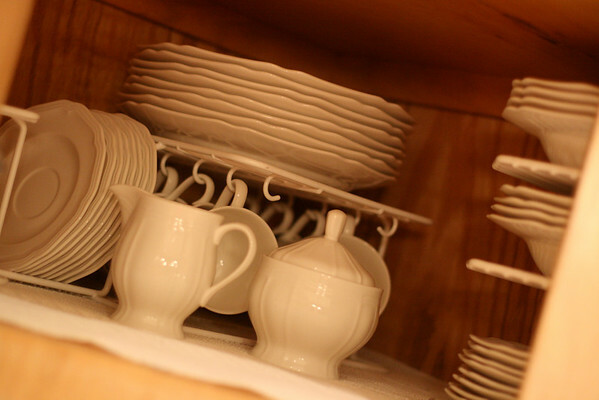 Oh, I almost forgot, another shelf area was cleared out for our new white dishes. This makes me giddy as well. Four boxes were dropped off at Goodwill and two big bags went to the curb. Just to let you know that perfection does not reign (ha!) 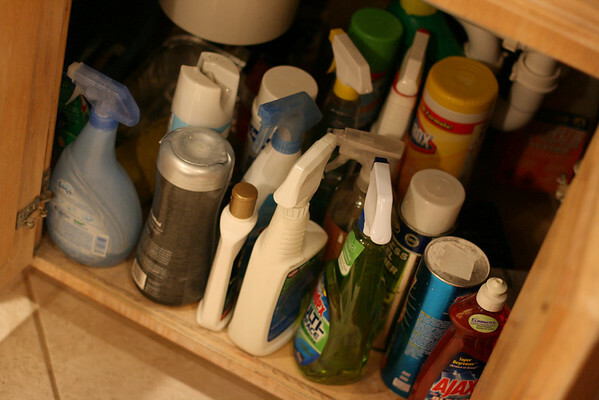 in our home, the cabinet under the sink still needs attention. I plan to use plastic baskets to create some semblance of order under there. I can't tell you how wonderful it feels to be free from all of that STUFF. Well, yes I can, it feels FABULOUS (jumps up and down and spontaneously busts out a herky). I think I have some kind of organizing high going on because I keep tip-toeing back in there to peek inside all of the cabinets and stand there grinning from ear to ear. Now I'm moving on to the pantry...while the organizing endorphins are still coursing through my veins. Now that's inspiring. You rock. And you made it look just fun-and-worth-it enough that I might even venture into the dark recesses of my kitchen, too. Great job! Good work! 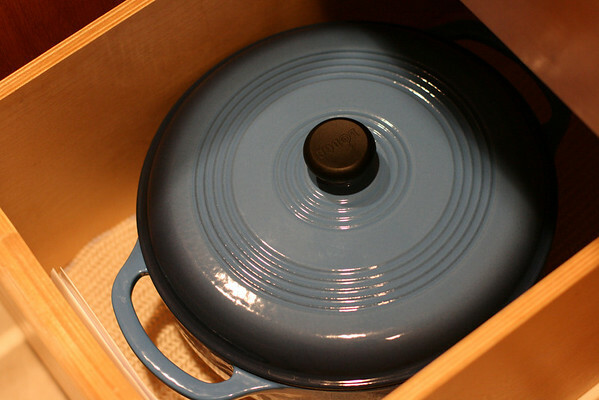 But your dutch oven could have stayed out--it is pretty! I have to keep my big pot and a smaller sauce pan on my stove because I have no other place for them. I do semi-regular purges in the kitchen because the clutter gets to me too fast. I do save ketchup packets though, because I hate cold ketchup! Way to go, I'm seriously impressed! I need to do this in my kitchen too but have been mentally preparing myself before I get buried in mismatched Rubbermaid containers and water bottles. I love the way it feels when I finally take the plunge and do something like this, it's definitely an endorphin shot for me too! Good for you!!! I"m not jealous at all... Do you want to come do mine??? Holy heck kitchen stuff! LOL I have nothing compared to the before pics you posted! LOL I could have taken your donation! Don't you love the feel of an organized space! I did 1 junk drawer the other day & it made me feel good! What's next? Thanks y'all! It was worth it--and really didn't take as long as I feared. It feels sooooo good to have things under control (or at least better) and for everything to have its place. Very freeing!